GPS is useful to any forecaster, regardless of their background in statistics. 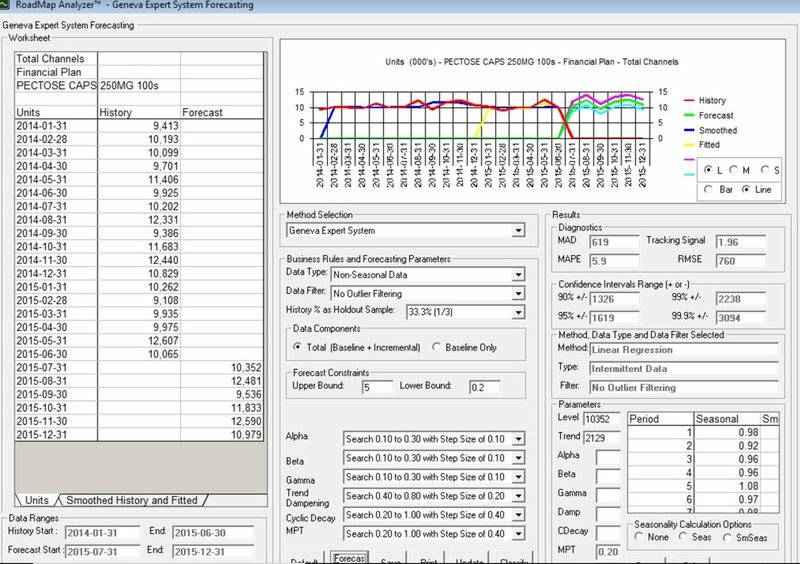 Users with minimal statistical knowledge will enjoy GPS‘ ability to automatically select an appropriate forecasting method, accurately compute forecasts, and quickly create graphs of the results. Users with extensive statistical backgrounds will appreciate GPS‘ ability to quickly compute forecasts with different parameters and automatically batch process thousands of data series. GPS is so elegant that anyone can quickly learn how to run GPS and eliminate the monotony of forecasting. Nonetheless, GPS allows advanced users to change specific forecasting parameters to gain greater control of forecasts. Inventory control planning by forecasting S-curve demand growth from increasing distribution. RoadMap GPS– Business planning and forecasting that combines the ease-of-use of Excel, the statistical power of R and the scalability of Microsoft SQL-Server. RoadMap’s proprietary Geneva forecasting algorithm can also be combined with the R Statistical Computing language to analyze Big Data sets with tens of millions of customer purchases or patient RX records.